GGEORGE TOWN: Police have set up a special 'Ops Cantas' team to monitor illegal gaming activities during the Bukit Gelugor parliamentary by-election, said Inspector General of Police Datuk Seri Mohd Bakri Zinin. "There have been past instances of betting, on who would win the election. If there is evidence, police will not hesitate to swoop on the culprits," he told reporters after a briefing on the by-election here today. 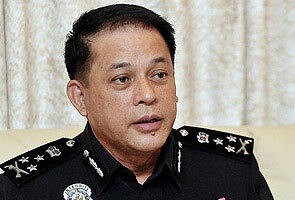 Meanwhile, Penang police chief Datuk Abdul Rahim Hanafi said eight reports had been lodged on the Bukit Gelugor by-election and two investigation papers (IP) opened under Section 24A(1) of the Election Offences Act 1954. "The two IPs involved claims of racism and bringing musical instruments during the nomination process," he said. He said the political campaign was under control and running smoothly without any unfavourable incident. Asked on the claim that the DAP was using a jeep with an expired road tax in their campaign trail, Abdul Rahim said police had not received an official report on the matter. "We only received a report in the blog. If we can track them, we will issue a summons. But we have not seen them using an expired road tax," he said.